This unusual and intriguing name is of Old Norse origin, and represents a rare survival of an Old Norse byname, "Sparkr", adopted into Olde English and taken into the Middle Ages as a hereditary surname. The name derives from the Old Norse "sparkr, spraek", lively, sprightly, vivacious, and was given originally as a nickname to one thought to be of a particularly lively character. 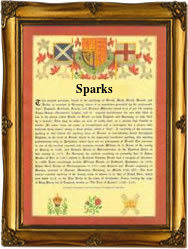 The surnames Sparks and Sparkes are the patronymic forms of Spark(e), the "s" being a reduced form of "son of". Early examples of the name include: William Sperc (1202, Lancashire); Ralph Sparke (1221, Suffolk); and Robertus Spark (1379, Yorkshire). The surname was also one of the earliest into America; John Sparks is listed in the "Muster of the Inhabitants in Virginia", taken in 1624, as having arrived there in the "George" in 1621. Examples of the surname from London Church Registers include the christening of Richard, son of Robarte Sparks, at St. Margaret's, Westminster, on August 11th 1577, and the marriage of John Sparks and Joan Compton at St. Andrew by the Wardrobe, on May 1st 1582. A Coat of Arms granted to a family of the name is chequy gold and green, a bend ermine. The first recorded spelling of the family name is shown to be that of John Sparkes, which was dated 1301, in the "Subsidy Rolls of Yorkshire", during the reign of King Edward 1, known as "The Hammer of the Scots", 1272 - 1307. Surnames became necessary when governments introduced personal taxation. In England this was known as Poll Tax. Throughout the centuries, surnames in every country have continued to "develop" often leading to astonishing variants of the original spelling.